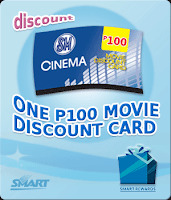 Smart, in partnership with SM Cinema, has innovated new ways of rewarding loyal Smart Rewards customers like me to enjoy more our movie experience. This promo is ongoing beginning April 2011. 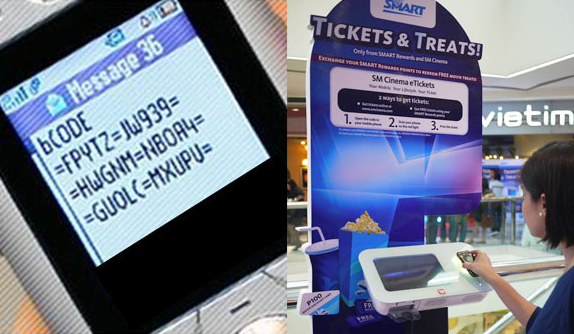 Your mobile phones can give you FREE movie tickets, discounts and other treats via bCODE. bCODE is an alphanumeric code being sent to your mobile phones. All you have to do is go to the nearest bCODE machine located at all SM Cinema branches nationwide and scan the bCODE from your mobile phones on the red light of the machine. Then you just press OKAY. The machine then will release a coupon that can be used to exchange at the movie ticketing booth or at the snack bar to claim your chosen reward. A bCODE is a combination of numbers, letters, signs and sometimes icons. 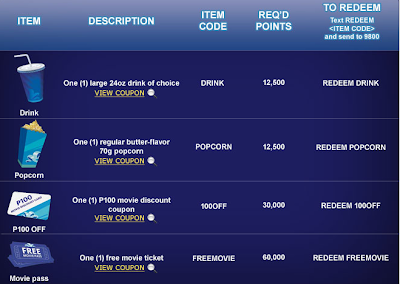 To receive a bCODE, you need to redeem the item in exchange for your points. Every item has an equivalent number of points. If you have sufficient points to redeem the item, all you have to do is to text REDEEM and send to 9800 for free. - Text POINTS and send to 9800 for free to check the number of points that you already have. - Text REWARDS and send to 9800 to know the items you can redeem. 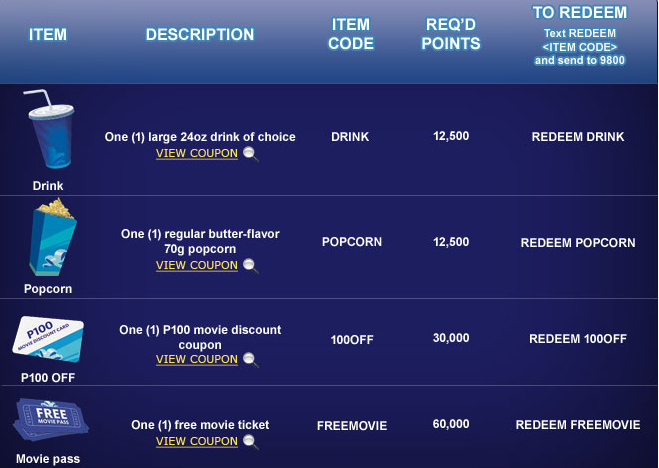 You can check out how I used my b-Codes to redeem my rewards at SM Cinema. Who can avail of this Promo? The bCODE service is open to all mobile subscribers and customers. However the rewards mentioned above are only offered to Smart subscribers: Smart Gold, Smart Buddy and Smart Bro. There are two (2) ways to use the bCODE service. 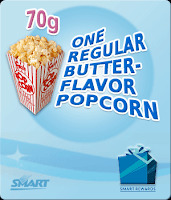 For Smart subscribers, redeem items using your points and exchange it using the bCODE machine. 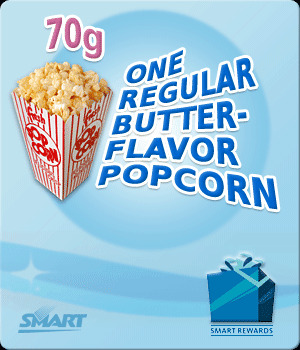 For non-Smart subscribers, avail movie tickets online via SM website (smcinema.com). Please be reminded that every bCODE is unique. It can only be used once. So even if you share it with your friends, the bCODE can only be used once. If you accidentally erased the bCODE from your mobile phone, don't worry. You can text REWARDS BCODE and send to 9800 for P1.00. If the bCODE is already scanned, and you are not yet ready to use it, you can still use it at a later date. Scanning the bCODE does not count for the actual redemption. As long as the bCODE machine doesn’t dispense any coupon, you can still scan the same bCODE at the time you decide to claim the item. When you scan the bCODE on the red light, it will give you three (3) options, which is either BACK, CANCEL or OKAY. If you prefer the FREE MOVIE, the machine will give you an option if you want to watch now or later. 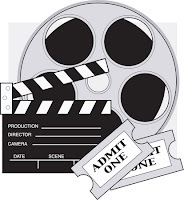 If you click NOW, it will ask you to choose the specific movie and time. And if you want to watch LATER, the bCODE machine will already dispense a movie pass. You can keep the movie pass until its due date indicated. When you decide to use it on a specific date, then you can have it exchanged to an actual movie ticket at the SM ticketing booth. 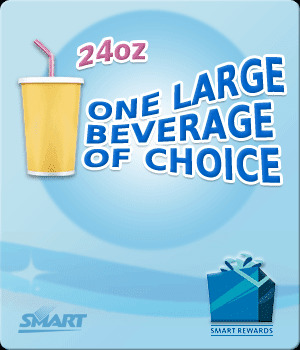 For more information and other queries, email customercare@smart.com.ph. SMART Buddy and SMART Gold: dial *888 using your mobile phone.